What should we expect from the economy in 2019? Given what happened in December into the first few weeks of this year, maybe a neck brace is in order. But the dramatic ups and downs of stocks may not last. Many economists see 2019 as a slow but steady growth year, with a possible slowdown but no recession. The U.S. Conference Board, a New York City-based independent business membership and research association, projects growth will slow from 2.9 percent in the second half of 2018 to 2.2 by the second half of this year. That will show up in smaller profits, but the board — like many economists — does not expect the next recession to start this year. The Fed’s policy on interest rates and the standing trade tensions with China will have much to do with what kind of a year it is, the board noted. Iowa business groups have largely been bullish on 2019 with some looming softness due to low crop prices and related manufacturing slowdowns. We asked Iowa economists to weigh in on elements of the picture, with Drake University’s Tom Root offering a broader analysis at our request. What are the biggest strengths and weaknesses you see in the U.S. economy in 2019? As 2019 begins, the fundamentals underlying the U.S. economy are strong. The labor market is widely considered to be operating at full employment. The strength is confirmed by many secondary indicators, not just the headline unemployment numbers. Compared to the growth period prior to the Great Recession, hires, quits, layoffs and job openings are all performing at levels better than their average from 2003 to 2007. The strength of the labor market has allowed strong consumer confidence to persist, even though the stock market saw a dramatic decline during the fourth quarter of 2018. Signs of potential weaknesses in business and manufacturing did show up in the data toward the end of the year with multiple indicators pointing to a possible slowdown in new orders for goods. What fundamentals do you see shifting the most in 2019? At the beginning of the year it will be very important to keep an eye on indicators of business activity. This starts with corporate earnings reports for the fourth quarter. Additionally, it will be very important to see if the declines in new orders and expectations for future orders were the beginning of a trend, or if the weakness shown at the end of 2018 in these areas was short-term volatility. A continued slowdown in business activity could further depress stock prices, put pressure on consumer confidence, and slow economic growth. What effect will tariffs have on international trade and the U.S. economy in 2019? The impact of the tariffs will depend greatly on the ability of the U.S. and China to resolve the current trade disputes. Without any change, the result is a slowed growth in both countries compared to 2018. An escalation of the trade war would result in slowing growth further. Additionally, as increased costs of imported components and materials filter through the economy, it could have a small inflationary impact on the U.S. economy. What is your forecast for U.S. GDP growth in 2019? Please explain your reasoning. My current prediction for U.S. GDP growth in 2019 is in the range of 2.25 percent to 2.5 percent. I believe that growth will be lower than in 2018, but that the economy will continue to expand. The faster growth in 2018 received a boost from fiscal stimulus, the impact of which will fade in 2019. Additionally, the increasing interest rate environment makes financial conditions less conducive to faster growth. What do you see as the most compelling trends in agricultural economics in 2019? The agricultural sector faces many challenges, including the impact of the trade disputes. Another important point to keep an eye on is the impact of the broader economy on the agricultural sector. The USDA recently estimated a decline of 12.1 percent in net farm income for 2018 compared to 2017, even after accounting for government payments linked to trade. Much of the predicted decline in income came from increased production costs. Increased interest expense accounted for almost 23 percent of the production cost increase, and hired labor costs accounted for another 9 percent of the increased cost. Given the fast economic growth of 2018 and continued expected growth in 2019, interest expense and labor costs will likely increase again in 2019. What’s one threat to the economy you are watching, and why? Heading into 2019, one of the greatest threats is continued policy uncertainty. The trade situation is very uncertain with both a potential reduction in current tariffs and new tariffs being imposed possible. The continued criticism of the Federal Reserve by the executive branch creates an atmosphere that makes it difficult to conduct effective monetary policy and hampers the Fed’s ability to communicate its intentions to the markets. Additionally, the new Congress brings with it an opportunity for increased political combativeness in Washington. The prospect of more political uncertainty can cause both business and consumers to lose confidence and postpone spending decisions, creating a drag on economic growth. To get a look from the financial world, we asked Mike Wilson, president and CEO of Federal Home Loan Bank of Des Moines, to weigh in on the overall economy. While volatility has returned to the stock market, we believe the U.S. economy is fundamentally strong. Job gains remain strong, and the unemployment rate is low. Household spending and business fixed investment have exhibited strong growth. Overall inflation, excluding food and energy prices, remains near the Federal Reserve’s target of 2 percent on a 12-month basis. The housing market has shown some leveling off in sales and prices recently due to two factors: limited wage increases and higher mortgage rates, both of which negatively impacted housing affordability. In addition, homeownership rates continue to underperform as younger generations delay home purchases. But homeownership remains the “American Dream,” so we would anticipate homeownership rates will increase in the future. Rising interest rates represent a bit of a headwind to the U.S. economy, but we don’t foresee higher interest rates having a materially adverse impact on the economy in 2019. Briefly, what’s one threat to the economy you are watching, and why? The biggest threat to the economy is uncertainty. Businesses are loath to make long-term decisions in the face of uncertainty. What’s the endgame in the trade war with China? How will Great Britain and the Eurozone fare post-Brexit? Those are weighty matters that could derail economic growth. HOW DO WE THINK OUR LOCAL ECONOMY IS DOING? For the eighth year, the Business Record asked participants to give us their thoughts in an unscientific survey. We asked if they think Iowa’s economy will improve, regress or stay at the same level this year. Opinions varied. We hope these insights will help you as you make plans for your own business. As it relates to the nonprofit world, I believe as the economy grows along corporate profits, charitable giving will remain strong here in Iowa. The banking industry as a whole expands and contracts in a direct relationship with the economy. 2019 will be another solid year. Residential real estate will experience an increase in resale inventory in the under $300,000 price range and that will spur more buyer activity, even with minimally rising mortgage interest rates. The metrics show that Greater Des Moines is outpacing Midwest peers in percentage of growth for gross domestic product, population and employment. The queue of economic and community development projects in the region is strong. Continued economic growth will help attract businesses to expand or relocate here, and we will see plenty of development projects advance. This momentum will also help our region’s ability to attract and retain talent. IT employment will continue to be constrained significantly and analytics software will continue to grow. The construction industry remains a bright spot in Iowa’s economy. With initiatives like Future Ready Iowa, funding for apprenticeships from Gov. Kim Reynolds and the Iowa Legislature, and support from the business community, the perception of a career in the trades has evolved. We are seeing significant growth in apprenticeship training as the majority of Iowans are awakening to the fact that it doesn’t take a four-year degree to have a good paying job. Stock market volatility is likely here to stay thanks to a destabilized White House, uncharted waters with federal policy on quantitative easing/quantitative tightening, record debt levels, and decelerating global growth, to name a few. However, volatility is nothing new in the stock market and in times of uncertainty lies great opportunity. The knee-jerk reactions of a very irrational stock market are best ignored for the long-term investor. With relatively little expansion, overall profitability for the financial institution industry will probably be flat. Banks and credit unions will be competing with each other for a larger share of a non-growing pie. This will cause decreased margins for the industry as we attempt to increase or protect market share. The on-demand nature of the economy is creating consumer expectation of discounted, highly-customized, quality food delivered to your door. The restaurant industry is poised for disruption in the delivery arena. It looks like 2019 will be similar to 2018 in commercial real estate. On the transaction side, I think there will continue to be a flight toward quality. The well-located properties with financially strong tenants and long lease terms will continue to see high valuations. Those properties not fitting that profile will continue to be scrutinized and discounted in an ultra-competitive market with patient money on the sidelines. Development will be active with many companies looking to expand or enter the Des Moines market. There are highly desirable development sites still available in Des Moines, which places us ahead of rival cities when retailers are looking to expand. 2019 will look much like 2018, with modest growth among our clients and relative stability among the insurance carrier marketplace. I believe that financing will be tougher to secure and developments will be challenging to execute. The confluence of increasing interest rates, and labor shortage will put additional pressure on project delivery. Being a Realtor, I believe there will be a normalization of our market. Record numbers of lots are for sale at inflated prices. Expect some adjustment to such as builders cannot sustain this level of pricing. Upper price range will potentially be a fickle market. If interest rates go up significantly more and if relocation (executive hiring) slows down, it will have an immediate impact on our market. Rural broadband projects will continue to move forward. Seed and venture capital will continue to find good ideas and teams, but more risk aversion may be seen among investors. We are a human services nonprofit. The economy has shown very little improvement in the last decade for the people we serve, but we were seeing signs of hope late in the year as less people needed our services. We now expect the number of people needing services to start increasing again. Companies need time to focus on efficiencies and employee training. Over the last year many companies we work with have struggled keeping up with workload due to the tight labor market. We did not use the tax cut effectively and people need to be paid fair wages. Lack of wage growth will hurt businesses in the long run as people pinch pennies on rising housing costs, education and healthcare. Declining agricultural prices driven by the trade war. Subsidies will not be enough to make up the difference. Briefly, what do you believe the biggest threat to Iowa’s economy will be in 2019? Impacts of global trade patterns and declining China and EU area GDP growth rates. President and CEO, Ingenuity Co. I feel that the biggest threat to the Iowa economy is the same thing that makes it strong — aversion to risk. Managing partner, Brick Gentry, P.C. The biggest threat to Iowa’s economy continuing to grow will be the lack of employees with the necessary and required skills. If the tariff war continues and interest rates rise, Iowa’s economy is at risk. There are two. One is a longtime issue, available workforce. The other relates to trade (including tariffs). 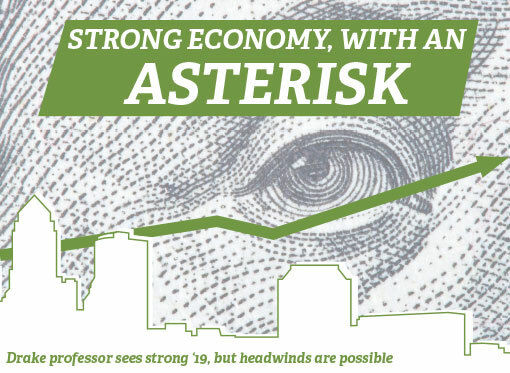 National economic forces are a strong headwind that will increase their influence on Iowa as the year progresses. Labor shortages within the state will take their toll. Unsettled immigrant issues, and the money that is being used to sustain their poverty level incomes and educating their children instead of money going to maintain infrastructure of our community. Income equality and its effects on working families in Iowa, particularly single mothers and the working poor, will continue to harm future generations. Our farmers are selling their produce at an operating loss for three-plus years running. Leveraged operators are having a difficult, if not impossible, time rolling over their loans. Our manufacturers are paying 30 percent or more for steel and aluminum versus their global competition. The trade war we are “easily winning” has begun to bite, and our state is quite export-dependent. These issues will have negative second order effects on our service oriented urban economies in 2019. CEO, Loffredo Fresh Produce Co.